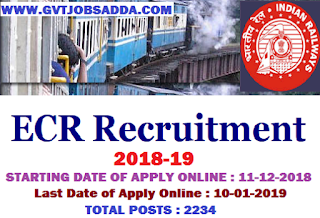 Railway Recruitment Cell (RRC) East Central Railway Recruitment Has published notification for apprentice vacancies for Apprenticeship Training under the Apprentices act,1961 over East Central Railway Those candidates who are interested in East Central Railway recruitment candidates should visit official website & check East Central Railway Recruitment notification and apply before last date of online apply. Brief information has given below. The upper age limit is relaxable as per government rule. 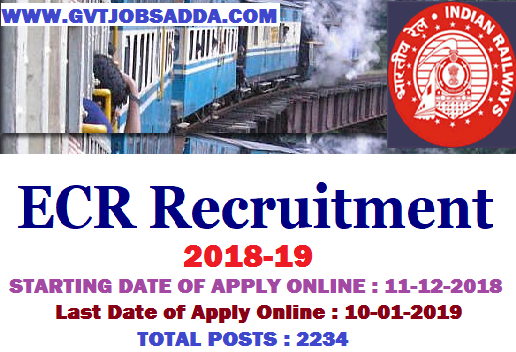 ONLINE applications are invited from interested candidates for engagement of Act Apprentices for imparting training under the Apprentice Act 1961 in the designated trades at Divisions/Units in the jurisdiction of East Central Railway against 2234 slots. Applications complete in all respects should be submitted only ONLINE till 17:00 hrs of the closing date. The candidate must have passed Metric/10th class examination or its equivalent (under 10+2 examination n system) with minimum 50% marks in aggregate, from recognized Board and ITI in relevant trade (i.e National Trade Certificate in the notified trade issued by National Council for Vocational Training or Provisional Certificate issued by National Council for Vocational Training/State Council for Vocational Training). Candidates are required to apply ONLINE by visiting www.rrcecr.gov.in. Detailed instructions for filling up ONLINE applications is available on the website.